Typical disaster recovery plans leverage backup and/or replication to move data out of the primary data center and to a secondary site. Historically, the secondary site is another data center that the organization maintains. But now, companies are looking to the cloud to become a secondary site, leveraging it as a backup target and even a place to start their applications in the event of a failure. The problem with this approach is that it merely simulates a legacy design and presents some significant recovery challenges. 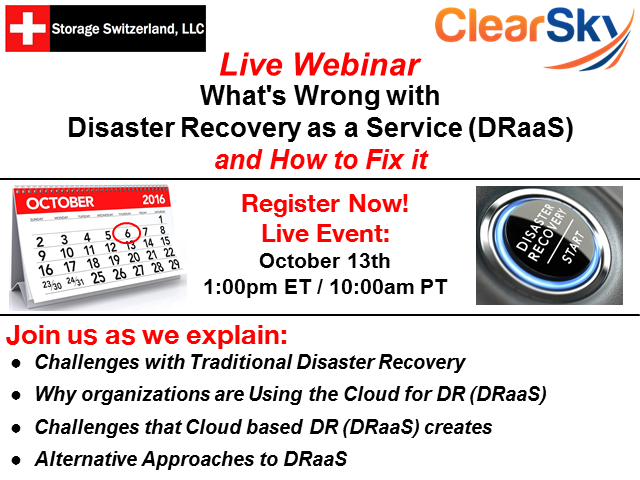 Join Storage Switzerland and ClearSky Data for a live webinar to discuss how organizations might be able to re-invent disaster recovery using the cloud.